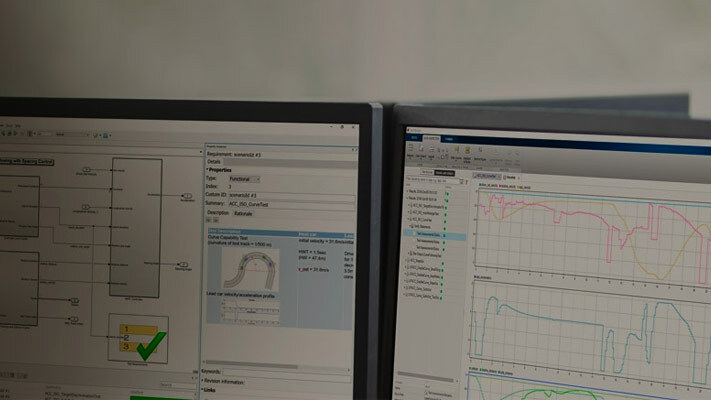 For a list of functions and objects in the Simulink® Test™ programmatic interface, see Test Scripts. This example shows how to use sltest.testmanager functions, classes, and methods to automate tests and generate reports. You can create a test case, edit the test case criteria, run the test case, and generate results reports programmatically. The example compares the simulation output of the model to a baseline. The test case fails because only one of the signal comparisons between the simulation output and the baseline criteria is within tolerance. The results report is a PDF and opens when it is completed. For more report generation settings, see the sltest.testmanager.report function reference page. This example compares signal data between two simulations to test for equivalence. In the Equivalence Criteria Result section of the Test Manager results, the yout.Ww signal passes because of the tolerance value. The other signal comparisons do not pass, and the overall test case fails. This example shows how to use a simulation test case to collect coverage results. To collect coverage, you need a Simulink Coverage™ license. In the Results and Artifacts pane of the Test Manager, you can view the coverage results in the test case result. This example shows how to create test iterations. You can create table iterations programmatically that appear in the Iterations section of a test case. The example creates a simulation test case and assigns a Signal Builder group for each iteration.